Walter G. Altman was born 15 May 1895 in Cordele, GA. 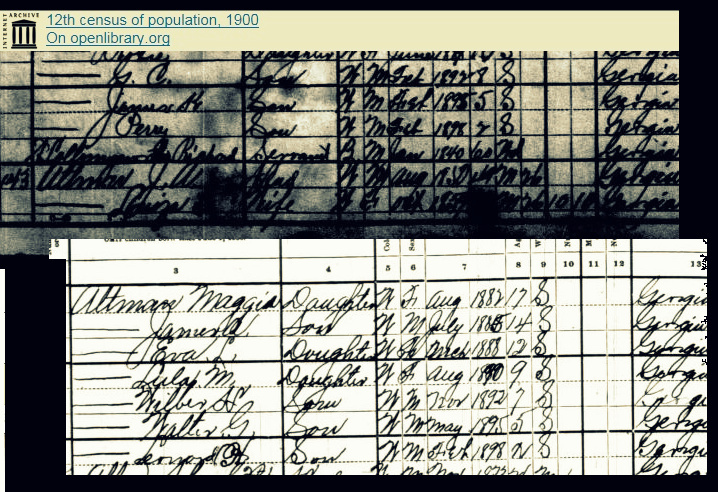 The 1900 census shows that at age five he was living with his parents, James & Louisa Altman, and family in a rented home in the vicinity of Bowens Mill, GA. Prior to 1917, Walter Altman had been living with his parents, James & Leslie Altman, and four of his siblings in Nashville, GA. All together, he had eight brothers and sisters. Walter attended school through the 8th Grade. The Altmans worked a rented farm in Nashville. Walter and his brother, Wilbur Altman, worked with their father in general farming. Some time between 1910 and 1917 the Altmans moved to Ray City, GA. Walter registered for the draft there on June 5, 1917. At the age of 22 he was still single, still living with his parents. He was medium height, medium build, brown eyes, and dark hair. He was working as a clerk for Nix & Miller Co sawmill operation, one of the historic businesses of Ray City. In 1918 Walter Greene Altman married Leslie Alma Langford. She was a daughter of William E. Langford and Mary Virginia Knight, and sister of Luther Etheldred Langford. Like Walter she had an 8th grade education. Shortly after marrying, Walter went into the ice business. Later he owned a cafe where Leslie worked as a waitress. By 1920, Walter G. Altman owned a mortgaged home on Jones Street in Ray City, GA (now 506 Jones Street). When census taker Annie Patterson enumerated the household of Walter and Leslie Altman for the 1920 census, she found the young couple with their newborn son, Walter Jr. Walter’s parents were living in a home just a few houses down the street, along with Walter’s siblings Wilbur and Eva. The neighbors were the Wright family, and the grocer Abe Levin and his family. Other neighbors included merchants of Ray City: men like Gordon V. Hardie, butcher; and Claud Clements, grocer. At 24 years of age, Walter was working as a self-employed ice dealer, supplying the homes and businesses of Ray City with ice. His brother Wilbur was also in the ice business. Ray City built a municipal electric plant in 1922, but dependable home electric service and electric refrigerators would not be available in the town until the 1930s. In the 1920s, small towns had ice delivery men, such as Wilbur and Walter, or Ferris Moore, who regularly supplied ice to chill ice boxes in local homes and businesses. In the census of 1930, Walter Altman was again enumerated at Ray City. That year the enumeration included a count of citizens who owned radio sets. In all of Ray City, there were only eight radio sets within the city limits, the owners being Walter Altman, James A. Grissett, John D. Luke, Henry Swindle, Marvin Purvis, John Simpkins, Joseph Johnson and Fannie Parks. The average cost of a radio in 1929 was around $139 dollars. In terms of comparable “affordability” for an average person in today’s dollars (2010 index) this would be like making a $7,600 purchase (relative worth based on nominal GDP per capita index – see MeasuringWorth.com). The following city officers were elected in the election held in the early part of December, L. S. Giddens, mayor, J. D. Luke, J. A. Purvis, Y. F. Carter, W. H. E. Terry, councilmen. The Altmans moved to Jacksonville, FL some time before 1935. In that year, they had a home at 1035 East Church Street. By 1940 they were back in Ray City renting a home for $5 a month. Census records indicate Walter G. Altman was disabled, with no income. His neighbors included Elzie Kelly, an ex convict who served time on a chain gang, and Joe Burgman, who was farming the place next door. 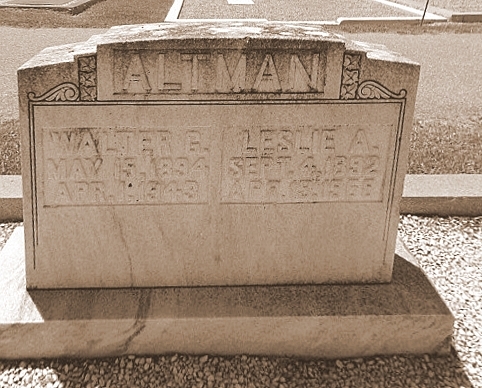 Walter G. Altman died April 1, 1943. His grave is at Beaver Dam Cemetery, Ray City, GA along with others of the Altman Family connection.